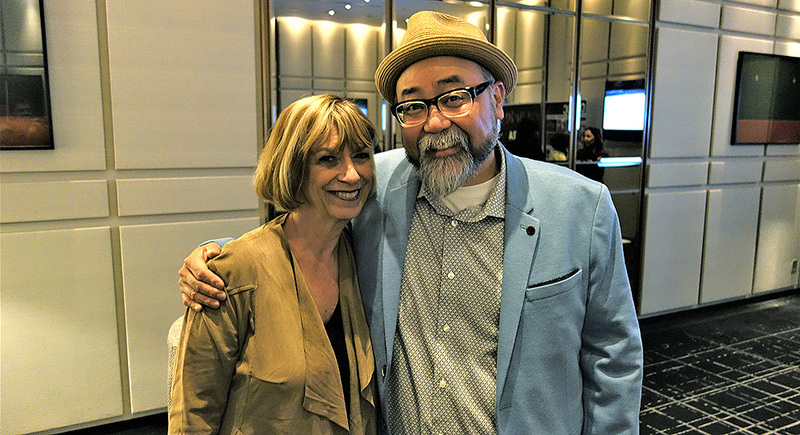 Judy Taylor from ABC-Disney with Kim's Convenience's Paul Sun-Hyung Lee. Photo by Cass Enright. (June 6, 2017 – Toronto, ON) One of the great things about living in a large Canadian metropolis is the vast diversity clearly seen everyday on the sidewalks of cities like Montreal, Vancouver and Toronto, to name just three. That oft-used phrase “Diversity is our strength” is proudly on display and can also be seen on screens large and small. But there can always be improvement and so ACTRA Toronto teamed up with the Ontario Media Development Corporation (OMDC), the City of Toronto’s xoTO film outreach and the Casting Directors Society of Canada to sponsor a casting session to showcase Toronto’s diverse acting talent to U.S. and Canadian studios and casting directors. Held on June 1st and 2nd at The Hazelton Hotel in Yorkville, the casting session introduced top-drawer and up-and-coming performers to U.S. and Canadian studios, production companies and casting directors looking to be more familiar with the depth of Toronto’s professional acting pool. NBCU, Fox, ABC-Disney and Bass Casting sent representatives. Canadian prodcos Halfire, eOne and Thunderbird were represented, and 10 casting directors from The Casting Directors Society of Canada attended. The initiative included a reception at the hotel on Thursday evening. Canadian stars Paul Sun-Hyung Lee (pictured), Simu Liu, Shannon Kook-Chun, Raoul Bhaneja, Divine Brown, Supinder Wraich, Amanda Joy and more were on hand to hear the OMDC and the City of Toronto reinforce their excitement and dedication to supporting diversity on screen. This is the fourth such initiative by ACTRA Toronto. In 2010, ACTRA Toronto hosted an open call with NBCU. NBCU returned later that year specifically to audition aboriginal and physically diverse performers. Meet-and-greets were also held in 2012 and 2014 for Canadian casting directors. ACTRA Toronto is the largest organization within ACTRA, representing more than 15,000 of Canada’s 22,000 professional performers working in the English-language recorded media in Canada.